The intertwining of sound and the body is fascinating and multifarious. Until fairly recently, sound has mainly been studied as an acoustic or auditive phenomenon. In turn, the body has been commonly approached as a physiological entity. Lately, however, the embodied and experiential aspect of sound has increasingly gained ground in research and pedagogies as well as in the arts. In this issue of the Journal of Somaesthetics, we invite contributions from various fields exploring sound as manifesting itself in the body, as originating from the body, or as a meaningful, embodied experience. The focus is on the body-aesthetic, or somaesthetic dimensions of sound. Aesthetic experience here is not limited to the arts alone. 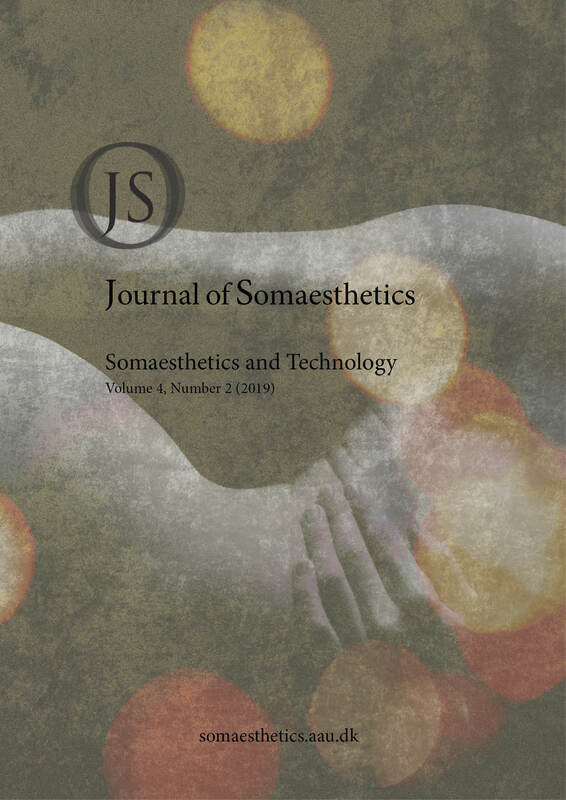 This special issue of the Journal of Somaesthetics contains articles that deal with the aesthetic relationship between technology and the soma. Special focus was intended on the applications of somaesthetic theories and practices on the design and evaluation of technology, and their comparison to other theoretical frameworks. Instead, we have mostly received contributions that are discovering somaesthetics. Regular and invited submissions went through a peer review, combined with editorial suggestions. We hoped the submissions would focus on the theory and practice of somaesthetics. What the articles have in common is their focus on the techno-social materials and themes. Migration, for example, is an important socio-dynamical construct. In the artistic work INTIMAL, Ximena Alarcón Díaz explores the soma expressions of Colombian migrant women in telematic sonic improvisatory performance work. The design of the system has been informed by several interdisciplinary practices including embodied music cognition and deep listening, as well as an oral archive with testimonials from Colombian migrants. Alarcón presents data from field work with migrant women and two experiments with groups improvising to the oral archive, while being recorded with optical motion capture and sensors for breathing and muscle activity. Based on the results, Alarcón presents the design of the system. Recently, virtual, augmented, and mixed reality had tremendous momentum. It is widely accepted that soma-based experiences will be an important design goal for these techno-social extended realities. We (Erkut and Dahl) present an approach of teaching virtual reality interactions, as used in our embodied interaction course for master’s students at Aalborg University. In order to help the students to develop the designer skills necessary for successful development of virtual interactions, the course includes theory on soma-based design, movement exercises with focus on first-person experiences, and a practical workshop jointly with students at the Danish National School of Performing Arts. We present four student projects from the course and discuss them in relation to experiential somaesthetics. Two invited papers aim to highlight new voices in the field. The Doctoral Committee papers from the 2018 Movement and Computing Conference were invited, revised, and organized by the guest editors. They together expand the bounds between body, brain, and environment to inanimate objects and matter in the environment. Kensho Miyoshi highlights the potential use of kinesthetic empathy in the context of design. Can the designers feel kinesthetic empathy to objects as much as they feel towards people? Beyond their function, could the quality of object movements evoke feelings useful for design? The author applies kinesthetic empathy to the perception of kinetic objects, with the aim of revealing the relationship between object movements and our embodied and empathic reactions. Kinesthetic empathy could open a new perspective on our embodied and visceral response to dynamic objects and environments, in relation to somaesthetics. In the second doctoral work summary, Garrett Laroy Johnson and his colleagues focus on techno-social construction of ensembles in designing responsive media. Within their work Lanterns, they show how people and augmented pendant lamps together form an ensemble and how people are entrained with the Lanterns. Based on the concept of ensembles, the authors summarize their design tactics and investigations, which provide insights about the embodied experience with respect to technicity. The highly speculative essay by Monica Yadav combines the diverse fields of neuroscience, philosophy, and theatre into a techno-social bound between body, brain, and environment. Specifically, technology, seen as a surface, produces in reflection an encounter of the triadic relation of body-brain-environment with itself. The author proposes that the triad is in both a material and virtual relation, where material and virtual are allelic pairs. This issue includes an insightful interview with Kia Höök on her new book Designing with the Body, conducted by Dag Svanæs. Not only did Höök “shop for” and transfer somaesthetics into actionable research in somaesthetic interaction design, but she also produced and documented beautiful soma design exemplars and literally “moved” an international research community with her effort. Svanæs, another strong mover on the importance of the body in interaction design, brings out fine details of the book in the interview. Both the book and the interview are highly recommended readings in soma-based design of the current and future technologies that shape us. The last contribution is a book review. Max Ryynänen critically assesses the anthology Aesthetic Experience and Somaesthetics edited by Richard Shusterman containing thirteen articles. Ryynänen discusses a selection of them concluding that the notion of somaesthetics, on the one hand, offers an accessible and necessary conceptual platform for thinking and practicing with and through the body, but that, on the other hand, the contributions are in danger of losing philosophical rigor and depth that could be regained by connecting to the field’s philosophical foundations as elaborated by Dewey and Shusterman. Compared to the first call for papers, the issue clearly is very different than we the editors have first imagined. The contributions challenged our disciplinary competences, indicated many future directions, and took us to reach out for reviewers in many different fields. We hope that they will have the same effects on you, including slowing down a bit and feel the fundamental question of interaction design with your entire soma: “what if …”. What allows us to kinesthetically empathize with motions of non-anthropomorphic objects? Somaesthetics is an interdisciplinary research product devoted to the critical study and meliorative cultivation of the experience and use of the living body (or soma) as a site of sensory appreciation (aesthesis) and creative self-stylization. An ameliorative discipline of both theory and practice, somaesthetics seeks to enrich not only our discursive knowledge of the body but also our lived somatic experience and performance; it aims to improve the meaning, understanding, efficacy, and beauty of our movements and of the environments to which our actions contribute and from which they also derive their energies and significance. To pursue these aims, somaesthetics is concerned with a wide diversity of knowledge forms, discourses, social practices and institutions, cultural traditions and values, and bodily disciplines that structure (or could improve) such somatic understanding and cultivation, and it is therefore an interdisciplinary project, in which theory and practice are closely connected and reciprocally nourish each other. It is not limited to one theoretical field, academic or professional vocabulary, cultural ideology, or particular set of bodily disciplines. Rather it aims to provide an overarching theoretical structure and a set of basic and versatile conceptual tools to enable a more fruitful interaction and integration of the very diverse forms of somatic knowledge currently being practiced and pursued. There is an impressive, even overwhelming abundance of discourse about the body in many disciplines of contemporary theory and commercial enterprise. But such somatic discourse typically lacks two important features. First, a structuring overview or architectonic that could integrate their very different discourses into a more productively coherent or interrelated field. It would be useful to have a broad framework (which does not mean a unified, highly consistent system) that could connect, for example, the discourse of biopolitics to the therapies of bioenergetics, the neuroscience of hand gestures to their aesthetic meaning in Nõ theater. The second feature lacking in most academic discourse on embodiment is a clear pragmatic orientation — something that the individual can clearly employ or apply to his or her life in terms of disciplines of improved somatic practice. Somaesthetics offers a way to address both these deficiencies. The journal therefore welcomes contributions exploring the field of somaesthetics through one -or more- of the many disciplines that already inform this field: philosophy, aesthetics, arts and design research, technology studies, somatic, health, and social sciences, history, physiology, psychology and pedagogy. The Journal of Somaesthetics is edited by Prof. Falk Heinrich (Denmark), Prof. Richard Shusterman (USA), Else-Marie Bukdhahl (Denmark), Prof. Stefan Valdemar Snævarr (Norway), Professor Dag Svanaes (Norway), Senior Lecturer Max Ryynänen (Finland), Prof. Arto Happala (Finland), Anne Tarvainen (Finland), Prof. Mie Buhl (Denmark), Associate Prof. Cumhur Erkut (Denmark), Associate Professor Sofia Dahl (Denmark, Sweden), Professor Kristina Höök (Sweden), Professor Palle Dahlstedt (Sweden), Associate Professor Yanping Gao (China), Professor Mathias Girel (France), Professor Leszek Koczanowicz (Poland).